Mapped this record after reading the blog by Jon Friedman (and this is not a “mismap” too). I may have one of the larger Dylan collections in the world, but never bought Self Portrait. Listened to it once with a fellow student (Bart Ellenbroek) and decided not to buy it. I was pleased to read in Chronicles that Dylan does not like the album as well (“I released one album – a double one – where I just threw everything I could think of at the wall and whatever stuck, released it”, page 122). Case closed. Till I read Jon’s blog. Bought it finally (the CD). I must say I like more songs than I liked then (e.g. Gotta travel on, In search of little Sadie, Early Morning rain), but Jon’s theory that it is a top 10 album can’t stand. I think it is a very incoherent, sloppy, inconsistent album (read the mind map for arguments). And I am amazed that so many sloppy songs “stuck to the wall”. I noticed as well that this is the first album Dylan started claiming copyright on songs he (at least morally) does not own. 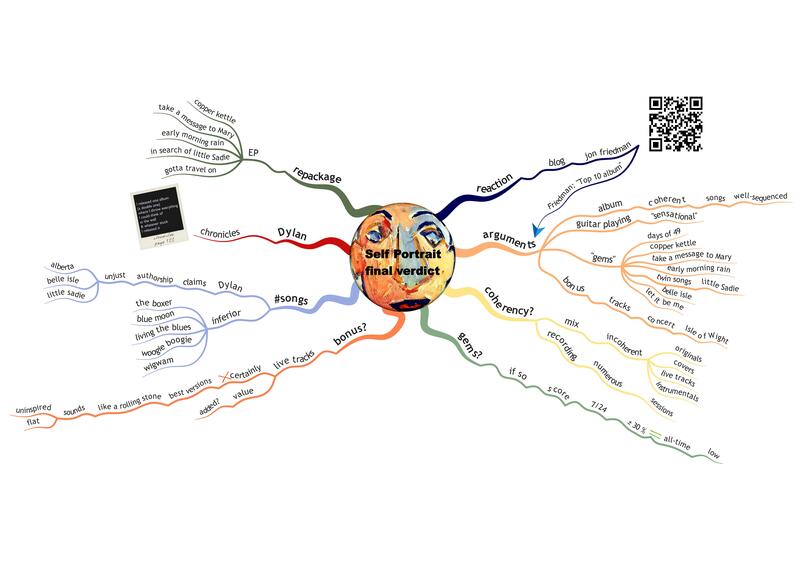 This entry was posted in mindmapping, music and tagged Self Portrait. Bookmark the permalink. I would say with Nahville Skyline, they were ready for a new Dylan ablum, after Nashville Skyline, they were not ready for a second country album and maybe Dylan being a dedicated country artist. If you ever hear the phone call with Weberman, Dylan is very unhappy with the reception of Self-Portrait. The rewrite of history in Chronicles is just that, a rewrite. Dylan wanted to make a charming country album and his fans then, and many now, are just not ready for it. 1969 “Nashville Skyline” – Reached UK #1 and US #3…I’d say they were ready. Can’t see why SP would be a good album, because people were ready based on the fact that Nashville Skyline reached #1. I’d mentioned this kinda thing in one of my older posts and I believe it’s true…why a double? Why bother adding the live cuts when he could’ve just thrown something else he recorded in these vast sessions? Naturally, I greatly enjoyed reading this post. I can understand some people’s bewilderment that I would have the chutzpah to place Self-Portrait in my personal Top Ten. I don’t mind that skeptics question me — and I don’t even care what Bob Dylan says he thinks about the album. I keep my own counsel. I sort of doubt that Bob would obviously work so hard on a TWO-record set, just to throw it against the wall. He has too much pride in his work, no? Feel free to check out post(s) on http://jonfriedman.net and my upcoming Dylan book to see more of my musings.